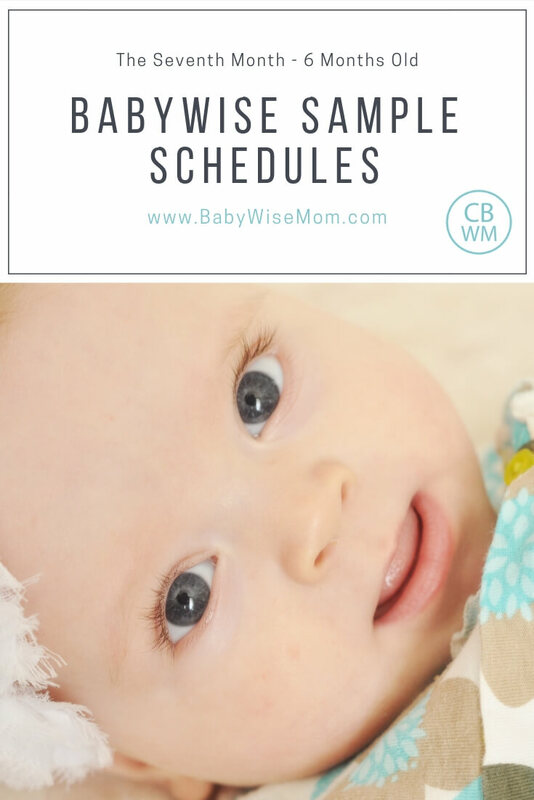 This post gives sample schedule Babywise schedules for the seventh month. 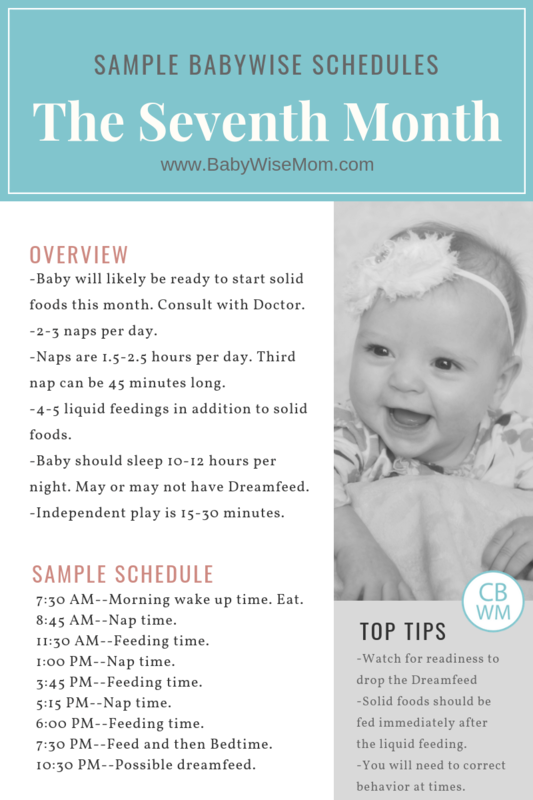 The seventh month of baby’s life comprises weeks 27-30. Baby is six months old. 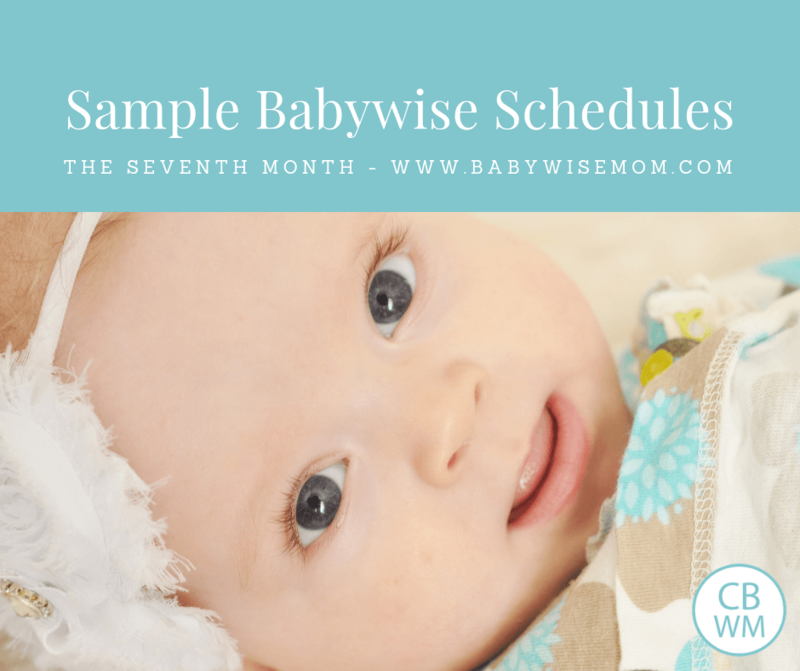 These are Babywise 6 Month Old Sample Schedules. Baby will likely be ready to start solid foods. Consult with your doctor. Baby will have 2-3 naps per day. Baby might be ready to move to two naps. Some are not ready for two naps until older. Average age for moving to two naps is 8 months. Have 4-5 liquid feedings in a day. This is in addition to the solid foods. Naps will be 1.5-2.5 hours each. The third nap can be short (about 45 minutes). Baby should sleep 10-12 hours at night. Sleep might be solid or it might include a dreamfeed. Independent play will be 15-30 minutes in length once baby can sit independently. Discipline will be needed if it hasn’t been already. Discipline means to guide and correct, not to hurt. I finally relinquished the dreamfeed. Kaitlyn basically started to refuse to wake up and eat, so I consented and dropped it. Her waketime had also started to extend a bit, and she started to need to go longer in the morning between feedings. 4:00 PM–wake, nurse, eat about 4 T yellow veggie, 4 T peaches or pears, and then 1-2 T oatmeal (sometimes she eats one bite only of oatmeal). 9:25 AM–nap (some days, she was up until 9:30, but her nap was disrupted. She would go back to sleep after talking for a few minutes, but that is unusual for her to wake and talk).